In a few days, Labor Day will be here. Labor Day weekend is one of my favorite three day holiday weekends of the year. It's technically still "summertime" and what I feel is the kickoff to the Holiday season. We will find ourselves on the boat, at the pool and cooking all weekend long. One thing I always bring to a Labor Day cookout is fun cocktails. Brancott Estate has a an amazing Chillhour website full of fun ideas for Labor Day weekend. From appetizers to cocktails, they have you covered. 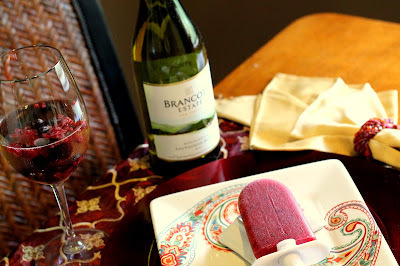 I chose to make Savignon Blanscicles and Berry Sangria, both of which are perfect to keep you cool on a hot summer day. Combine all ingredients in a cocktail mixer over ice and shake. Strain into a large wine glass. Are you making anything special for Labor Day? Disclosure: I received a bottle of Brancott Estate Sauvignon Blanc to create a recipe. All opinions are my own.